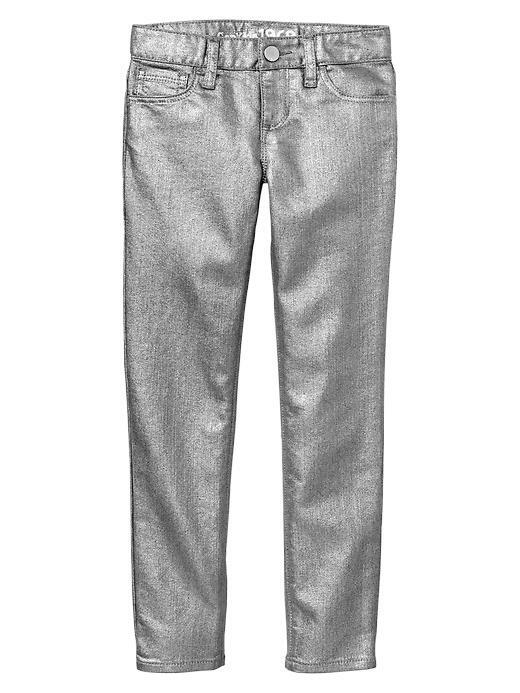 Gap Girls Jeans Fabrication: Premium supersoft stretch denim. Wash: Coated silver. Hardware: Button at center front (sizes 4 6 have a snap closure beneath faux button for easy on and off), zip fly. Features: Five pocket styling. The water used in the process of washing and dyeing these jeans has been specially treated to ensure it is safe and clean when it leaves the factory. Sizing: Concealed adjustable waist. Cut: Sits below the waist. Fit: Super skinny through the hip and thigh. Leg opening: Skinny. Inseam: 25". Measurements relate to regular size 8, other sizes will vary.